This 49-year old from the Springfield, Illinois area was seen seeking nose surgery (rhinoplasty) and a chin implant (mentoplasty). Her chief complaint involved the area of jowls, neck and the nasal area. While she had always been self conscious of the size and shape of her nose, she began to notice the appearance of lines and jowls in her lower face after the age of 40. 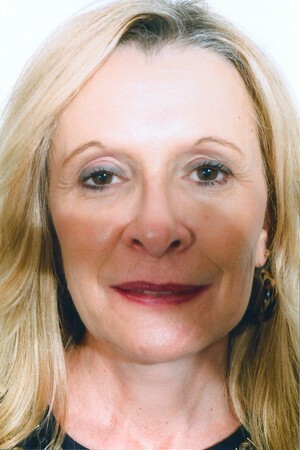 On examination, she was found to have a wide and short nose with visible nostrils in the frontal view. The lack of a prominent chin creates the appearance of an increased projection of her nose when looking at her profile. There is an appearance of jowls on both sides, being a little more pronounced on the right side. She also had a deviated nasal septum with some restriction of breathing on her right side. Rhinoplasty (nose surgery) and mentoplasty (chin surgery) in Champaign-Urbana’s Cosmetic Plastic Surgery fully accredited outpatient facility was carried out. This short outpatient surgical procedure was followed by a quick recovery with minimal bruising of the cheek area. A small cast was kept in place on her nose for six days. Although she noted a small amount of bleeding for 24 hours following surgery, she went on to resume routine activities right away with minimal discomfort in the chin area and no discomfort whatsoever in the nasal area. 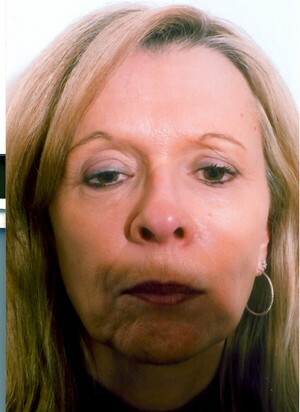 Her frontal views following surgery show a decrease in the showing of her naris (nostrils) in the frontal area with less width to her nose, and a disappearance of the jowls with a chiseled look to her lower jaw area. The profile views show a nose with a decreased nasal height and increase in nasal length, which brings the middle portion of her face in excellent proportion to the upper and lower facial areas. She has a normal chin projection with a cleaner and well-defined jaw line and neck area. She is delighted with her surgery because, as she states, she looks like the same person as she did before; however, her frontal and profile views are now quite flattering as compared to prior to surgery.